Focal is also known by the Grande Utopia - e.g. 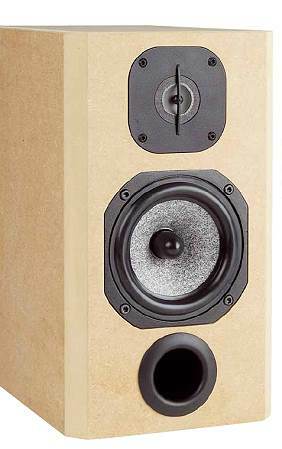 the Grande Utopia EM, regarded by many as one of the best speakers available. Therefore, it would make sense to offer kits with Focal drivers also to the DIY. Focal Esprit is a monitor with premium Focal drivers. The Esprit has an extremely balanced frequency response. The kit contains a concave titanium dome Focal TC90 and a Focal woofer with the famous W-cone: the 5W 3211B. The crossover is of 12 dB/oct. type and could be kept simple since the drivers are extremely balanced and don't need absorption circuitries and wave traps. "Already during the crossover design and the first listening test it became clear that this speaker possesses fieriness. And this is confirmed during listening tests of the final version. Since the bass produced by this 13 inch is abnormal. Deep, powerful and well versed, yet still with outline galore and excellent transparency. The Esprit makes a subwoofer obsolete, this compact speaker will make everyone happy, unless you listen to elongated organ pipes all day. At the same time the 5W jumps wildly, but that doesn’t prevent the achievement of intense output levels and clean mids for as long as possible. Why the tweeter became a legend will soon burst upon you in the listening room. Due to an extremely clean and detailed presentation and never renouncing the positive effects of the metal dome, the tweeter contributes substantially to the nippy and direct sound of the Esprit. I would almost describe it as loudness, but in reality it’s something else. It’s rather the sheer purity and attention to detail that gives this impression. Yet still, the focus of the Esprit seems to be on the midrange. As you know, there is no accounting for tastes. I am somehow looking for the utmost openness of mid frequencies in loudspeakers. That should be easy to achieve, but isn’t. A simple accentuation of mid frequencies is just not good enough, it would make vocals only louder but not more transparent. No, everything has to fit like a glove: design, drivers and crossover. To me the Esprit is a speaker where the vocals are spot on. Male and female vocals are so unbelievable open and clear that other speakers sound as if they were hidden behind a curtain. Both, the slight midrange accentuation by the 5W and the extremely open sound of the TC90, have a part in it and both complement one another perfectly. You probably know what I mean, when you sit on your couch pricking your ears in anticipation of the first breath of the female vocalist and realise that the sound is disappointing and not particularly delightful; then the sparkling Esprit is for you." "Focal used to be and is (again) a real enrichment of the DIY market. And these radiators from France didn't lose their charm. Highly direct, rich in detail, airy, crisp and with lots of pace - all these characteristics turn the Esprit into a tremendously enjoyable speaker and shows clearly that the Focal's credit is well deserved."